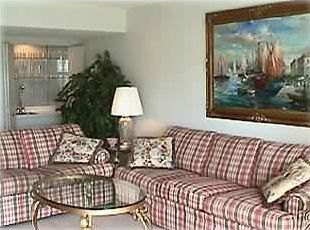 Our Shipwatch condominium is located directly on the Atlantic ocean with beautiful views of the ocean and the pool. The views you see were taken from our balcony. The 2131-square-foot living area has three large bedrooms each with its own full bath located within the bedroom suite. Depending on the sleeping arrangements, it can accommodate 10 guests. The adjoining suite can sleep an additional 4-6 again depending on sleeping arrangements. Please inquire if you have any questions in this regard. The condo has beautifully decorated rooms with oil paintings and tile floors and for additional privacy when you retreat to the lower floor it is as though you have gone to another condo! The bedrooms/baths and laundry area are downstairs and upstairs is a large kitchen, half bath, living area, wet bar and separate formal dining room. The large balcony has three sets of sliding glass doors that gives floor to ceiling views from every room upstairs. The balcony is furnished with a beautiful table and chairs for enjoying your coffee as the sun rises or dining under the stars. The condo is located on the Amelia Island Plantation. Enjoy the hundred year old Live Oak Trees that drape the roads and bike paths right next to the sea. And for those who wish to relax and be pampered, a day at the Spa is fabulous! Whether riding bikes on the miles of paved bike trails, fishing, shopping, or horseback riding on the beach, there is always something to do on the Plantation! There is so much to do (or NOT do)!! You may want to explore the island or prop up your feet and just relax! It is your vacation and we want everyone in your group to enjoy it 'their way'!! Those who stay up late at night or rise early in the mornings will not disturb others who may want to stay in bed. It really is like having two condos!!! All three of the bedrooms are suites with the full baths located within the bedroom suite. All baths are identical with a full bathtub and overhead shower, toilet and sink on a long vanity....no having to get dressed and go down the hall in the middle of the night ...or having to share!!! Two of the bedrooms are Master Suites with a king size bed and a separate dressing area with a large mirror and long vanity where you can apply make up or style hair while someone else is bathing and the steam is not a problem! The third bedroom has two twin beds that can be pushed together to make a king bed by using the connector in the closet. The condo has more storage space than most homes!!! There are several walk-in closets and also other closets and storage for linens etc. There is a large washer and dryer behind closed doors in the beautiful downstairs foyer with separate entrance and also a closet in the beautiful upstairs foyer next to the new powder room. It also has a separate entrance. The kitchen is large enough for several cooks and has lot's of pots and pans, dishes, glassware, and beautiful silverware. There is a formal dining room with access to the kitchen using the bi-fold doors or they can be closed....whatever you choose. The furniture is beautiful and has a china cabinet for additional wine glasses etc. The living room blends with the dining room and has a 50 inch plasma flat screen TV and a wet bar. Three sets of sliding glass doors are side by side , giving a 20 foot view and also access to the balcony. Floor to ceiling views are possible from every room upstairs. There is another closet on the balcony with some grilling accessories. There is also a dining table and chairs on the balcony for relaxing and enjoying the view. We are the closest condo to the pool in our association....no walking from several buildings away!! You can also grill on our new grills located to the left of the pool while you swim. The condo is designed with top of the line beautiful furniture and it has all tile floors every where except the staircase which we replaced with wood so the condo is not only beautiful it is maintenance free. The two full Massaud Sofas both make fold out queen size beds with a mattress so that the condo can sleep 6 to 10 people. If needed, the adjoining suite can sleep and additional 4 to 6 people. Having a condo this large and on two floors is wonderful ....upstairs is for fun and if someone is tired or wants privacy, they can go downstairs! Grandparents don't have to keep the same hours as children and everyone doesn't have to watch the same TV programs! This condo is great for weekends but also has such a well designed plan with so much storage and closets...it could be lived in year round! We chose to buy our condo because nowhere else in the world have we found century old oak trees draping right next to an ocean. The perfect harmony of nature and wildlife together with the sounds of splashing waves we hear from our condo made it our only choice. Also we can be at the Jacksonville International Airport (JAX) in 25 to 30 minutes. Our island sits in a cove that has protected it from major storms for many years. The many restrauants, unique shops and world class spa make it a dream come true and an escape from reality! Our condo has a wonderful floor plan! When our family gets together it is especially nice to enjoy each others company and yet sometimes it is nice to slip away downstairs for quiet moments! It really is like having two condos. If someone gets up early to watch the sunrise with coffee in the mornings, no one else is disturbed and if others stay up late...those in bed will never know. Also having a full bath located inside each bedroom is wonderful. (5) There are four cordless telephones in our condo. One in each bedroom and one in the living room with a answering system so you never miss a call. A new air conditioner was installed in 2010. A full size HE washer was installed in 2013 and is conveniently located inside the condo. A full size dryer was installed in 2013 is conveniently located inside the condo. Multiple parking spaces for your vehicles and even a golf cart section. Wires in TV hutch for direct connect to the Netgear Nighthawk wireless router for fastest possible speeds. Towels and beach towels are provided. Free high speed wireless internet is provided by Comcast Cable. A new dishwasher was installed in 2010. The large kitchen is wonderful for larger groups and can be closed from other areas or opened by using the bi fold doors. This kitchen is large enough for several cooks!! With 6 chairs in the main dining room and a table and 6 chairs on the connected balcony, you can have 12 eating dinner together all seated within each others sight. We also have another dinning room. All TV's are either a 50' or 60' plasmas in the living room, and in every bedroom. Living room 5.1 surround system is also bluetooth compatible with your devices like cellphones, so you can stream free music via Pandora directly to the sound system. Smart WiFi Bluray/DVD players in every room so you can access online content such as Netflix, Hulu, etc. Multitude of family board games and puzzles are in the upstairs closet. Beach/pool toys and boogie boards are in the downstairs storage closet. We offer a large selection of videos and a few DVD's for all ages to enjoy! A very large covered balcony with three long sets of sliding glass doors is accessed thru both the dining room and living room and extends the beautiful view and has a table and chairs for enjoying the outdoors. Our condo is the closest unit to the pool in our association. The picture you see of the pool was taken from our balcony. Our association also has the largest pool of any other association on the resort. The covered gazebo is wonderful for those wishing to enjoy the pool without the sun! A new 60' plasma flat screen TV and DVR are in the living room, a 50' plasma TV is in one master king suite and a 60' plasma TV is in the second master king suite. The 3rd suite has a 60' plasma as well, and each have WiFi Blurays & VCR's. Ask for more details. We request a minimum of three nights September-March 1st but we welcome last minute bookings! We had a Grand time at the Condo - 4 small children loved the pool and the beach and a lovely little island with playground. Also, nature center and game center with mini golf close by. We all left the family reunion refreshed and rejuvenated. Renting bikes was also a highlight - the trails were so fun to ride on. Very much enjoyed the stay, condo just as described, responsive and gracious hosts, beautiful island and community. The condo was great, especially the views of the ocean and overlooking the pool. Loved the coffee maker. The condo was clean and the huge beds extra comfy. The owner was very gracious and sent all kinds of recommendations. The plantation area was beautiful, hoping some day to go back and spend more time. My stay at property 22258 was great. The condo had the space we really needed to accommodate me and my girlfriends. Mr. Moore the owner was great in helping with the rental and fee. I will be willing to rent her again and tell my friends and family. First of all our hosts were amazing, so kind and helpful. The condo held all of us easily, there were blow up beds available if we needed it, and a crib and pack and play (which we didn't but it was considerate of them to have them). Plenty of towels and linens and cookware and beach toys, chairs etc. The beds were really comfy too! The view and pool and beach were incredible. It is hard to find such a large home at Amelia Island and I am so glad that we did!! We traveled with 8 children and found this place to be perfect for a family trip! The condo was beautiful and well stocked for all our needs. The owner even added a crib and pack-n-play for the baby, along with baby gates for the stairs! It is located right near the pool and only a short walk to the beach. The balcony overlooks the pool with a excellent ocean view. We watched the sunrise each morning while drinking our coffee. The owner was easily available for questions and very friendly. I could not have asked for a more perfect place to stay for this family vacation! The resort has a World Class Spa, Shops, and Restaurants,Collect Seashells and Sharks Teeth, Read with your feet in the surf, Grill dinner while swimming, Ride bikes on miles of paved bike trails, Fish on the beach or ponds, See the Sunken Forest. Visit Fort Clinch and see re-enactments of soldiers during the Civil War on select dates. Visit the Jacksonville Zoo 30 minutes away. Play miniature golf inside the Plantation or outside on Sadler Road. Go Deep Sea Fishing or fish from the shore. Surf. Boogie boards and jump the waves. Watch the sun rise over the Atlantic Ocean while drinking your coffee. Read a great book while sunbathing. Visit downtown Fernandina and spend the afternoon at all the unique shoppes. Go to Cumberland Island where the rich once played, and view wild horses on the beach. Best of all, enjoy our large spacious condo that is closest to the pool and unlike most others it is heated during the winter!! Sit on our 20 foot balcony or by the pool in the sun or under our large gazebo for those who want to be with friends and/ or family but don't want to be in the sun. Walk the miles of paved bike trails or along the sandy beach. You may never want to leave the condo or the property! !